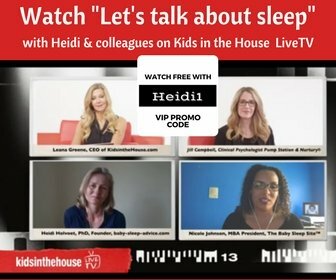 Question: Hi Heidi, I have a 12 week old that i'm trying to set a nap schedule by using my Ergo Baby Carrier. I've been carrying him for naps for about a week now. He naps once in the morning from about 10-12, then again from about 1-3, and again from 4-6. I tried to put him down for the past few days after he goes into a deep sleep, but he would wake up within 10 to 20 min. I'm not sure what I am doing wrong but without fail, he would wake up but he would sleep really well when I carry him. It usually takes him about 30 min to go into a deep sleep. At night he has a bedtime ritual of bath, bottle and then either me or my husband will carry him in the carrier till he falls into a deep sleep and then put him down. Usually he is ok at night when we put him down, sometimes he would wake up and then we'll carry him again and he usually falls asleep well. Then we dream feed him before we sleep and he usually wakes up once during the night, almost always at 3am and gets a bottle and then it's not regular how much he sleeps after that. Sometimes he wakes up around 5ish and I carry him and put him to sleep again and he'd usually sleep till about 7am at which point he will get fed again and sometimes he'll sleep again and sometimes he won't. I see two possible reasons why it's not been a great success: first of all at 3 months old he's quite young still and may not set well into a regular schedule yet. The reason is that his baby sleep patterns are still changing very much right now. Also one week is about the minimum. Even if he is ready age-wise, ready for regularity and longer naps, you may very well simply need to do it for 2 or 3 weeks on end before really seeing the desired result. Altogether I'd advise you for now to give it a bit of rest, say for a week or two, three. Carry him when you can, for longer if you want him to take a longer nap. By carrying him just half an hour longer (so 1 hour in total) you will have helped him through to the second sleep cycle. If you put him down then, there's a good chance he can keep sleeping for another 30-40 minutes. PS: Have a look at my "Nap in a Snap" guide. It has easy tools to set up the best-fit nap routine for your baby ... and to help him sleep those naps well too.